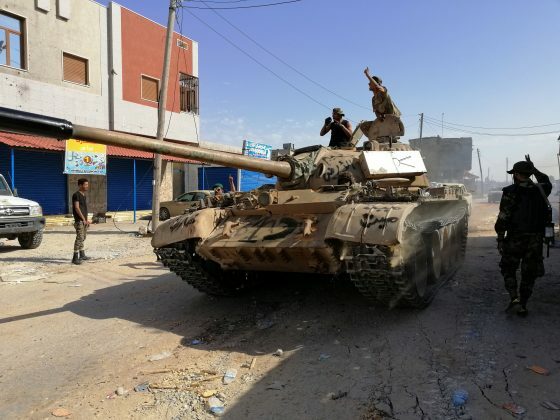 TRIPOLI (Reuters) – Eastern Libyan forces bogged down in street battles in a push to seize the capital Tripoli deployed warplanes on Friday to hit several government positions, as more civilians fled the fighting. But forces loyal to Prime Minister Fayez al-Serraj’s internationally recognized government have so far kept them at bay, with fierce fighting around a disused former airport about 11 km (7 miles) from the center. A week of battles has killed 75 people – mainly fighters but also 17 civilians – and wounded another 323, according to latest U.N. tallies. Some 9,500 people have also been forced out of their homes. As the sound of fighting echoed around their city, residents sought to maintain some normality on Friday. Haftar casts himself as a bulwark against Islamist militancy who wants to restore order to Libya. But opponents see him as a potential would-be new dictator like Gaddafi. This entry was tagged Eastern Libyan forces, Haftar, Libya, Libyan National Army, LNA, Prime Minister Fayez al-Serraj, Tripoli, WHO. Bookmark the permalink.